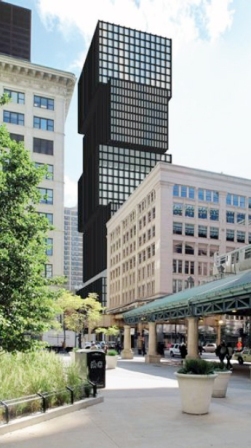 Chicago’s South Loop skyline may be getting a new bobble in the form of a boxy rental residential tower across from the Roosevelt University vertical campus. Designed by Lothan Van Hook DeStefano Architecture, the black boxes cantilever over the edge of the one below, creating a cubic counterpoint to Roosevelt’s zig zag. Many of these stacked box schemes—including a project in Jersey City by OMA and the dead Museum Plaza by REX in Louisville—have never made it off the drawing board, so it will be interesting to see if the locals can pull it off.